When you look for the first astrophotography camera, you can be baffled to discover that there are models dedicated to the planetary/lunar high magnification images, other dedicated to long exposure shots of faint objects, and others to autoguide. 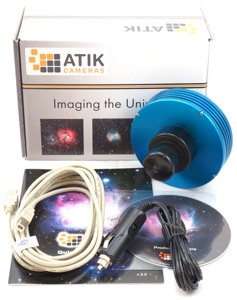 The Atik Titan camera offers all the features required for each type of use so it's perfect for those who want to purchase a camera that can perform many different tasks. The Titan color camera offers all these features together with a sensor that takes already in color pictures, for greater ease of use in respect of the monochrome models. In fact, you will observe and record in real time the colors of many objects such as Orion Nebula, Jupiter's cloud formations or Mars atmosphere. Thanks to the Atik Titan you no longer have to choose between planetary and deep-sky imaging. You can now do both, making this the perfect newcomer's camera. As a deep-sky camera, the cooled CCD with low read-noise allows detection of faint details over long exposures. Planetary imaging moves the goal-posts from sensitivity to resolution, requiring fast frame rates to capture moments of best seeing. Excelling at both, the Titan is the perfect introductory camera. In high-speed mode, the Titan is able to record up to 15 frames per second in uncompressed 16-bit format. The high frame rate is important in order to capture moments of steady 'seeing' when the image becomes clear. The 16-bit digitisation makes it easier to pull spectacular detail out of low contrast objects such as the surface of the Sun, or the cloud belts of Saturn. The Titan has a remarkable 5-electron read-noise in deep-sky mode. This is better than that of many astro-cameras costing thousands of pounds. The low read-noise allows faint detail to be teased out of the Titan's images. The Titan also features advanced cooling for long-exposure imaging. The Titan's autoguide port and high resolution makes it usable also as guide camera (note: for this type of use, we suggest the monochrome version since it has more sensitivity). It sports a standard ST-4 type guide socket on the back for direct connection to a mount. Guiding can be performed through our Capture software, or programs such as Maxim DL, Astroart and CCDSoft. Capture software is included for camera control and data acquisition, and plug-ins are included to allow use with Astroart and Maxim DL.